Not terrible, but definitely looks very temporary. Because I’d be spending so much time here (hello, blog life! ), it was important to me to make this space more inspiring and functional, and with that comes the necessity to increase storage, so I started by replacing the wall poster with a couple of shelves. The shelves are the Ekby Hemnes shelves from IKEA. Also from IKEA are the Ekby Valtar brackets, which I spray painted gold, of course! On top of the shelves is where I express my love for boxes and tchotchkes. On my desk is my fabric covered magnet board that I use as a mood board, consisting of magazine clippings, photos, and anything else that’s inspiring me at the moment. It’s been pretty fun posting things up on it and I plan on updating it regularly. 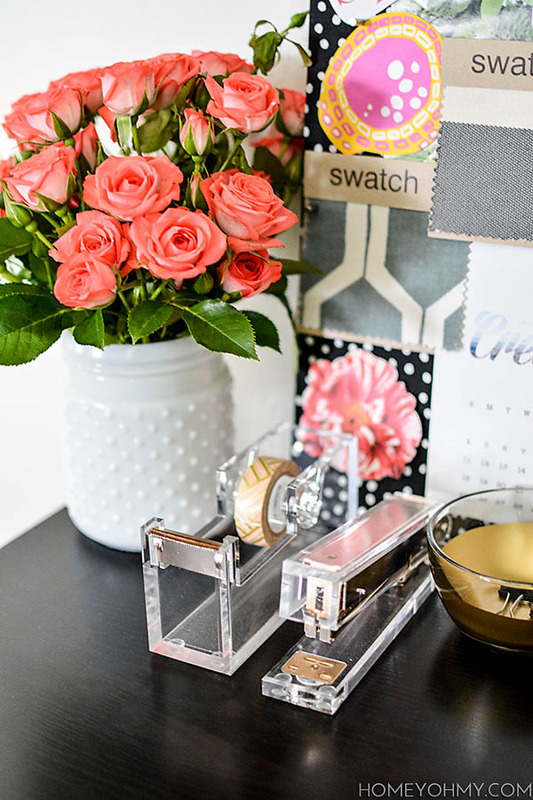 Also, I’m sure you’ve noticed all the gold accessories galore, and I’ll be including a DIY and source list for everything on my desk at the end of this post, so stay tuned! I shared the acryclic tape dispenser and stapler on Instagram a while ago and y’all went nuts for them! I’m nuts about them, too ;). And I also recently posted a little sneak peek with the African roses, which you guys loved as well. Isn’t it great how we can all love the same things together? You guys are the best <3. We’ve arrived at my favorite part. I mentioned in my Ghost Chair Inspiration post that I got me one of these babies and I love her more than I ever could have imagined. Surprisingly comfortable, and mega gorgeous. The best chair splurge of my life, and it makes me look forward to sitting at my desk even more. *UPDATE* I’ve gotten a lot of questions about the gold lamp, so here’s the link for it: See it here. Did you notice everything is mostly gold, black, and white? How appropriate, since they’re my FAVS. Red naturally made it’s way in since my work space is in a corner of my living room, which has a lot of red accents. As already mentioned, the striped accent wall tutorial is yet to be posted up, so make sure to come back for that! If you have any questions about anything else in my work space that I didn’t cover, leave them in the comments below and I’ll get back to you. Or if you just want to say hi that’s cool too :D.
I love the mix of prints. It really helps to set off this space. What a gorgeous work area. So chic. Love the black, white and gold accents!! The striped wall is pretty amazing too :) I will definitely look into those shelves because they look fantastic! Gorgeous! So pretty! Now, you need to come over to my house and design my workspace. It is on my list of things to do this summer and hopefully I can make it look as nice as yours. I love all those pretty boxes! It looks AMAZING! What a difference just a few small changes made. I can’t wait to hear about your accent wall! I’m soooo ready to get working on our office! AH-MAZING! This is seriously gorgeous. 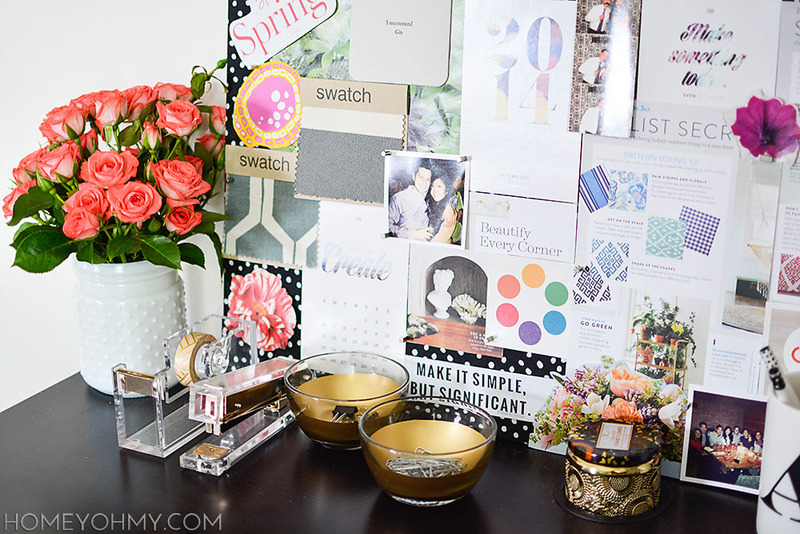 I love that it totally portrays your style and you added the personal touches with the mood board. I always wondered if those ghost chairs were actually comfortable! This is gorgeous!!!! OH my goodness! You have really inspired me to take my home office to the next level. 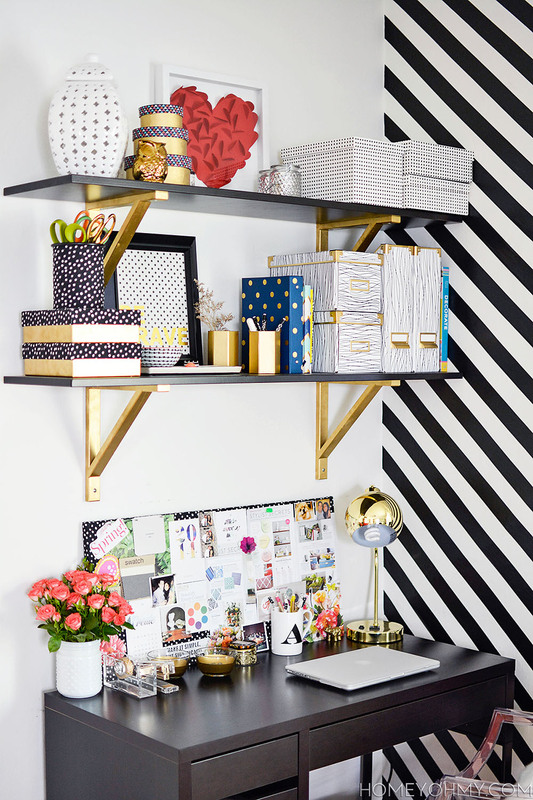 It’s incredible how the stripes on the wall and accessories make it so ooh la la! I just pinned the %@~! out of this haha. GORGEOUS. Great job girlie. Wow! What a difference! It looks absolutely amazing. If that’s what my work area looked like I’d have no trouble buckling down and doing work all day. Great job! LOOKS AMAZING!!!! I love the diagonal striped wall and ghost chair. Having a nice beautiful space to work in makes such a difference. I love it, Amy! Oooo Looks so good Amy! Love how many DIYS are included in the makeover. Can’t wait to see how you did the accent wall! I’m speechless, girl! You have a killer eye for design! 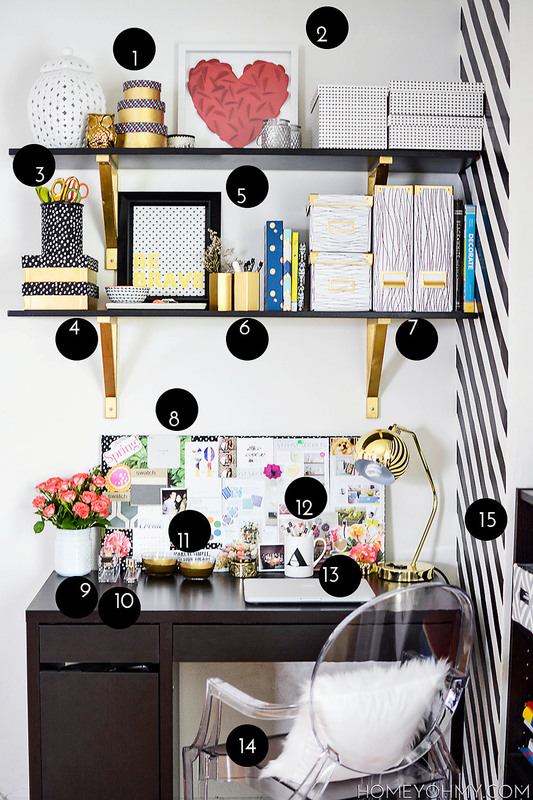 I love how your workspace looks.. the black,white, metallic gold combination was a hit! Well, no surprise here… it’s stunning!! You kept it classic just like your style and it’s lovely! Totally loving that accent wall, too! Can’t wait to see the post on it. Great job. Oh Amy, your space is so fun!!! Love all the gold accents! You did a great job! What a lovely work space you’ve created. 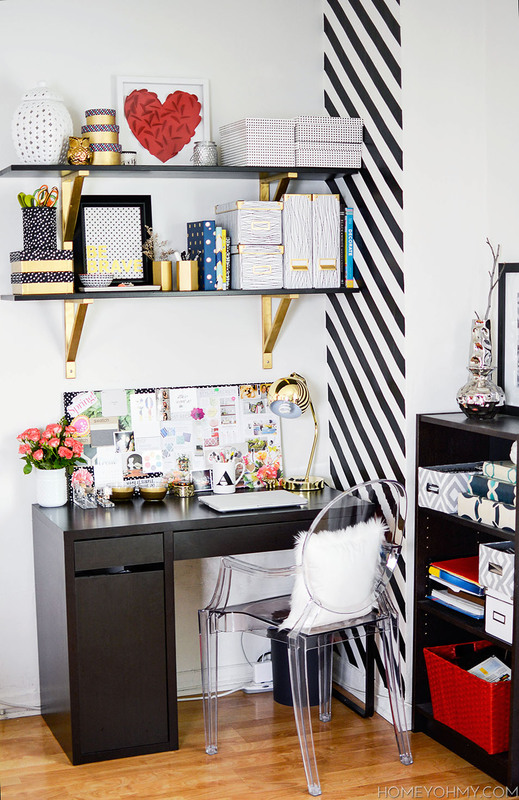 The striped wall is such a great focal point and the inspiration board is surely to bring many more awesome DIY projects. It looks so great. I noticed that diagonal striped wall straight away. Love! I. Am. OBSESSED!!!! Love it, girl!! So chic + classy…I love this nook! Girl you put everyone to shame with your mad skills! I love this work space soooo much! Amy! Oh my gosh this space is so beautiful and looks straight out of a magazine! I wouldn’t be surprised if it’s featured in one soon enough :) LOVE! 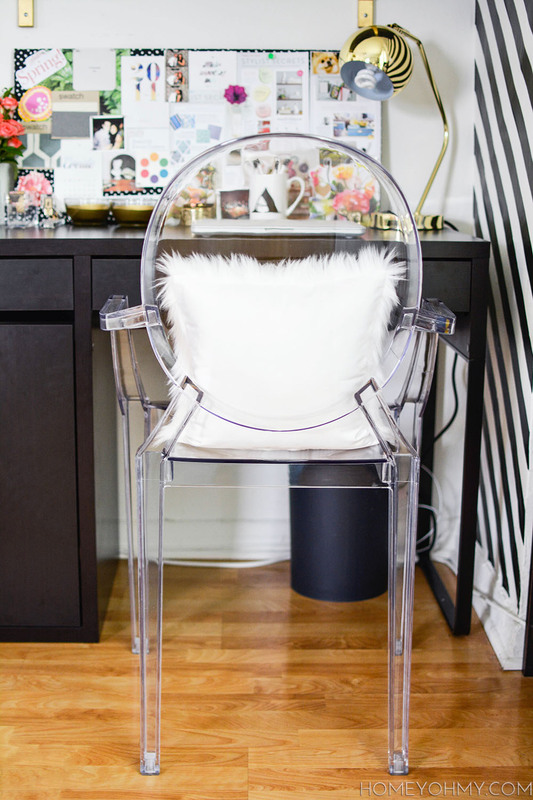 The acryclic tape dispenser and acrylic chair are my favorite parts! 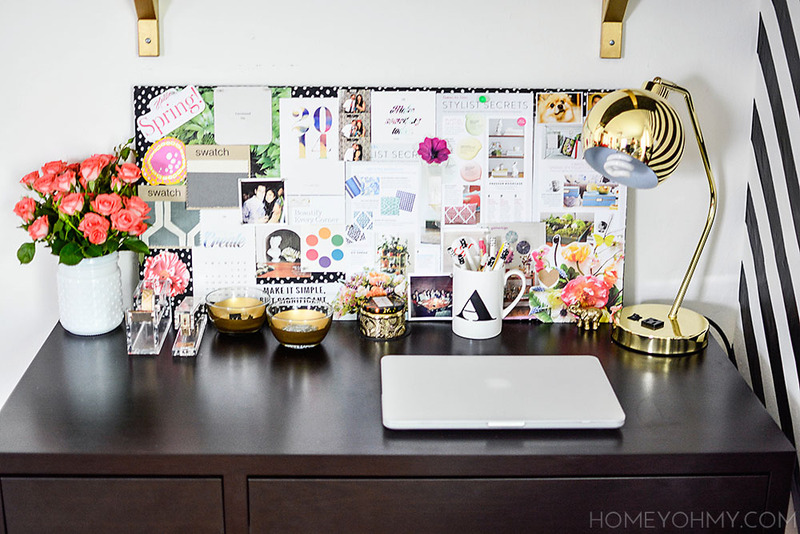 I love all the storage and personality you added to this work space! I would love it if you’d link this up to the Frugal Crafty Home Blog Hop–I love to share big transformations like this with my readers! I LOVE this space! Please tell me where you got that amazing gold lamp?? Hi Kate! I got the gold lamp here at Urban Outfitters. It’s almost 30% off right now! Your office space looks great. I love the black, white, and gold accent colors. So super stunning Amy – wow. I love all of your beautiful gold and glam touches!! What a great transformation:) Pinning!! 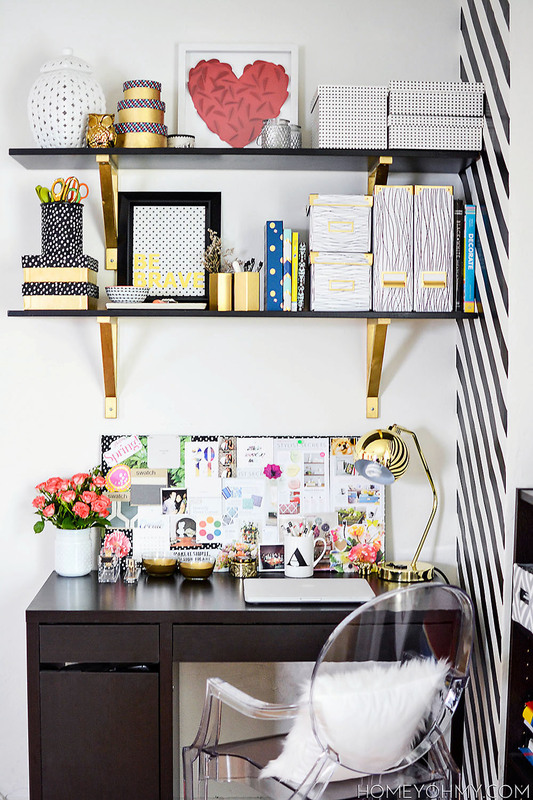 I love the striped wall with all the gold accents! I love how the gold really takes it from casual to sophisticated! :) Looks great! Obsessed! Such a lovely job and so many great DIYs!!! Wow! This is absolutely gorgeous! I’m not sure where to look first. I don’t think that I would get any work done here as I would spend all of my time admiring it. lol! Thanks for sharing at The Inspiration Exchange – I’ll be featuring it tomorrow. Have a great weekend! Beautiful! I love the square framed art on top of the bookcase. Do you know where you got it? what kind of spray paint did you use for your shelf brackets? I LOVE this! What a gorgeous, eye-catching and inspiring space. 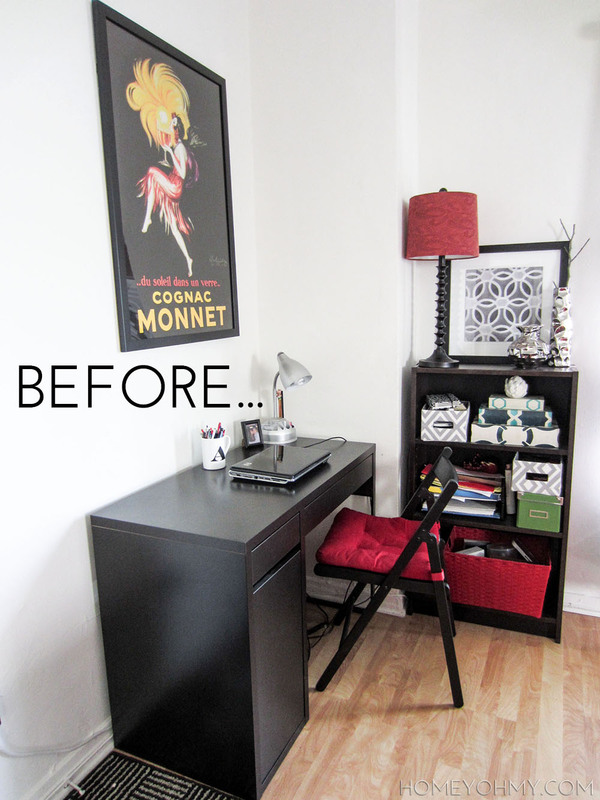 I can’t believe how totally you transformed it, and with so many DIYs too. That’s the most impressive part to me, since I’m terrible at DIY’ing. All of the black and gold are just perfect, and I’m in love with my ghost chair as well, so I love that you have one! The IKEA shelves are probably my favorite. You made them look SO chic with the gold spray paint. So lovely! I discovered your blog on Pinterest via this article ! 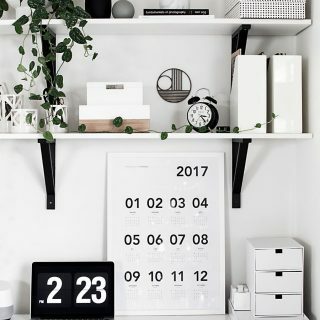 I’m really in love with your workspace and wanted to share it like an inspiring source in my own blog (here is were you can find the article : http://plume-de-libellule.com/deco-tu-tiens/ ) I really hope you will like it and you won’t mine if i took your pictures for exemple. 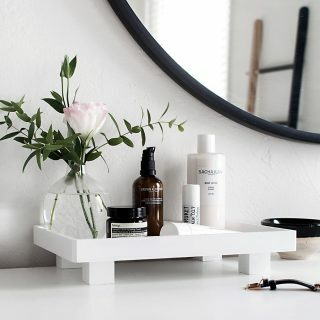 I’m a french jewelry designer and trying these days to do a hole make over of my workspace and here you are with all your good ideas : i’m just in love !!!! Thank you for beeing so inspiring and so fun and sorry for my bad english ! I am soo in love with this work space!! I recently moved and finally have a little work area for myself and I just have no idea how to decorate it… Thanks for the inspiration! I am definitely going to follow you. Also wondering where you got that great lamp? Thanks! 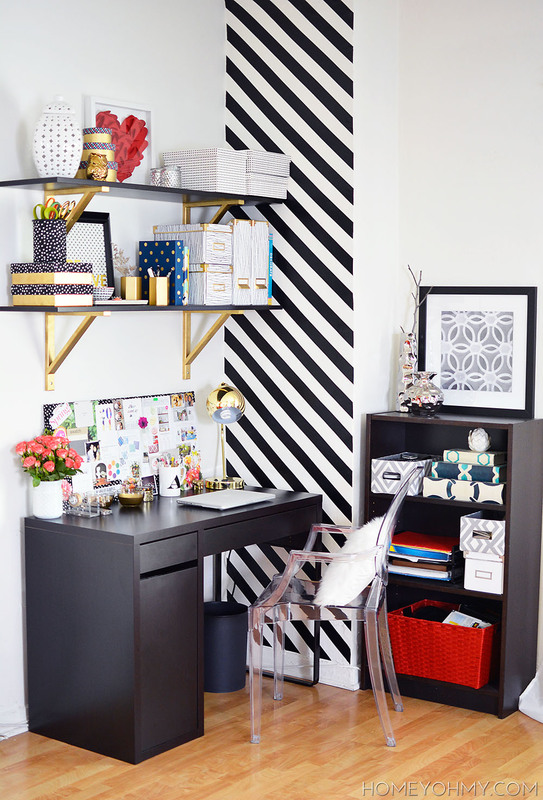 I absolutely love your little office space – the black and gold is perfect! LOVE this space!!! The gold adds SO much!! This is great. One day I hope to have a workspace that pretty. Thank you Gina! I didn’t prep the brackets at all. Unless you’re going to be touching them all the time (which my guess is that you won’t) there really isn’t more you need to do than just paint them gold. Mine have held up perfectly so far! Where is the ghost chair from? Also, the acrylic desk accessories and fur pillow? For some reason the links listed aren’t working :( or maybe it’s me?! Hi! I just tried the links and they are working fine. Try them again? I didn’t link to the fur pillow because I purchased it locally and isn’t available online. Thanks for asking! Yep I tried them today from my office desktop and they worked! Must be something wrong with my phone. Thanks! Where did you find that case and those flowers!? Amazing! Ahhh! I LOVE this idea! 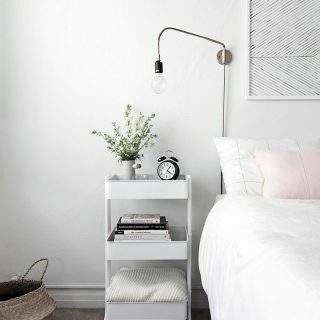 I am moving into a new apartment and need all the inspo I can get! Thank you!! Any chance you could tell me where you purchased the shelf brackets? Thank you. You created a gorgeous space.